Being in the mood for a classic British Mystery, I turned to La Grande Dame herself, Agatha Christie. This one features four crime solvers, at least in a sense, with Adrian Oliver, detective story writer, plus Colonel Race, Inspector Battle and Hercule Poirot. Four people were playing bridge in a room where the only other person in that room is murdered. Which of the four bridge players is the killer? Inspector Battle, being of Scotland Yard, takes over the case, but the others are included in the process of separating the three innocent (of this murder, at least) suspects from the guilty one. Finding the killer is no easy task, and as is so often the case, requires searching into the past for the clue needed to solve the crime in the present. I thought I knew who did it, then was wrong, then thought I knew again…that’s how it goes with Christie books. I enjoyed this one a lot and if you’re thinking of reading a Christie this would be a good one to pick. This entry was posted in Books & Reading, Friday Forgotten Books, Mystery and tagged Chief Inspector Tibbett, Patricia Moyes. Bookmark the permalink. I read CARDS ON THE TABLE back in the 1960s when I was binging on Agatha Christie (I read a couple dozen of her mysteries in a month). I remember liking CARDS ON THE TABLE very much. Do you ever reread these, George, or was it one and done for you with Christie? I gather this isn’t the cover you remembered. Read this one years ago. I’ll bet if I read it again, she’d still fool me. Bill, she was an extraordinarily good at plot, wasn’t she. I still enjoy trying to – and usually failing to succeed – outguess her. I remember this one very well – I read it along with 40-50 others in my first big mystery-reading (and Christie) binge in 1971-72. I don’t remember the killer, however, and I bet if I reread it she’d fool me again. I must admit there were several of her books that I figured out (Peril at End House was one) but usually she fooled me. I thought having four of her characters would be too gimmicky, but it worked to good effect. 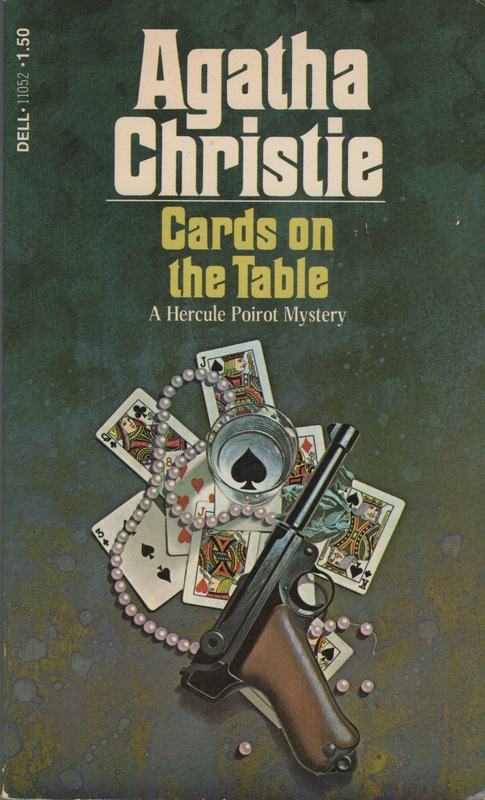 For me, going back and reading a Christie, especially Poirot and Marple, is comfort reading. I should read more Christie I’ve actually only read one. It’s a matter of taste, and what you feel like reading at the time, I think, Charles. I get in the mood for Christie and often rip through two or three at a time. I am re-reading Agatha Christie books, in order, sort of. At least within each series I am going generally in order. So it will be a few books before I get to this one. It sounds interesting with all of the various detectives. I usually experience the same thing you described when reading Christie. I think I know who did it, then I am sure I was wrong, then sometimes I go back to the same person, and I usually don’t know who it is. Tracy, no doubt she’s a clever plotter, and it always makes sense once it’s all revealed. I admit I like the Poirot books the best, then Marple. I’m not as fond of the Tuppence and Tommy and the others. This was among the first Christies that I read and I have never forgotten Mr. Shaitana as also the murderer. Easily amongst the top Christies for me. Thanks for the post, it makes me want to pick it up once again. Yes, Shaitana is a memorable character, even if he does get killed early on. Thant’s not a spoiler, it was obvious from the beginning. Todd, she named the victim, which was obvious early on, not the killer. Did neer just tell us whodunnit? I thought I had read this one when I saw the title but now I think I haven’t – I might listen to it actually – I’ve taken a liking to Christie stories narrated by Hugh Fraser who played Hastings in the ITV series – he does a great job and the stories lend themselves well to the format. Bernadette, I agree that Christie books lend themselves to audio, and I have heard one or two of Laurie’s readings and liked them.